On Saturday, December 22nd the House passed continuing resolution to fund the US Government awaiting a full floor vote in the Senate. 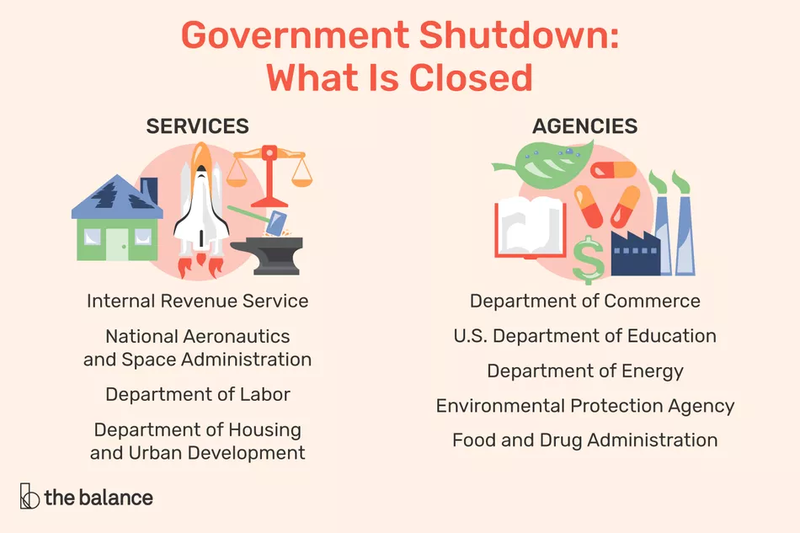 POTUS Trump campaigned on building a border wall but political push back over the requested $5.6 billion in funding has led to a partial “Shut Down” of the federal government, mostly for “non-essential government employees” in nine (9) federal departments. Homeland Security – 13 percent of 232,860 workers. Justice – 17 percent of 114,154 workers. Agriculture – 40 percent of 95,383 workers. February food stamps could be cut. Treasury – 83 percent of 87,267 workers. Tax refunds could be delayed. Interior – 78 percent of 68,469 workers. National Park maintenance has decreased. Transportation – 34 percent of 54,230 workers. Some security screeners have called in sick. Commerce – 87 percent of 47,896 workers. Environmental Protection Agency – 95 percent of 13,872 workers. It can use reserve funds to stay open through December 28. Housing and Urban Development – 95 percent of 7,497 workers. So you can see the largest percentage of employees considered non-essential are housed in HUD, Dept. of Interior and the IRS. Ask yourself why that is. These workers will get paid back pay when this furlough ends. So why is everyone so concerned? There is certainly more to consider than what has been presented herein. You’ll have to come to your own conclusion and do more research as necessary. Opinion – This is all political theater. 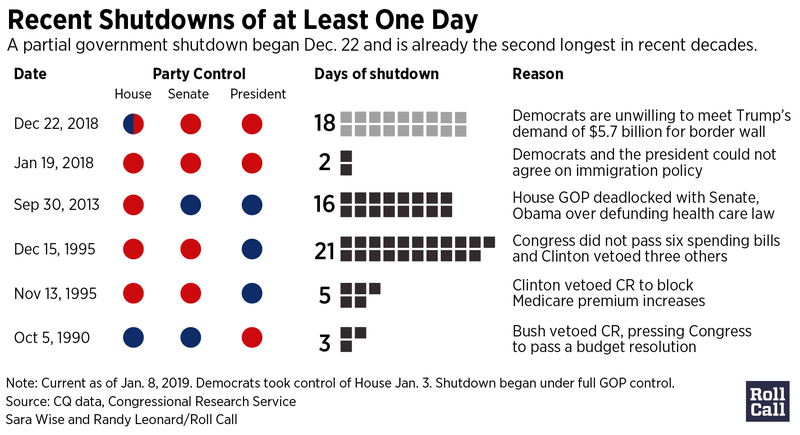 Many Presidents in recent past have triggered (for lack of a better word) shutdowns. The left and the right don’t agree, but it has more to do with House and Senate Democrats depriving President Trump of his key campaign promise. POTUS Trump promised to build a border security wall to protect all Americans from violent crimes, slow the influx of drugs for Mexico and Central America, as well as, stop illegal aliens from entering via our southern border. Foreign elements and their people do not respect our laws. They like our living conditions, job availability, and our welfare system. Unfortunately, about half of the legal born citizens of our great nation buy into the emotional false narratives the Main Stream Media hammers into their brains. Additionally, the US spends more than the $5.6 Billion requested in just three(3) days on various welfare programs, almost $2 Billion per day. In 2019 and 2020 Conservatives will need to band together and put minor differences aside to preserve the freedoms we now enjoy. Democrats are being extremely petty and obstinate but they are banding together to form their own “wall”. The President will use the National Emergencies Act of 1976 in drawing down necessary funds for this wall by declaring a national emergency. Then, and only then, will these non-essential workers go back to being non-essential at your expense. This entry was posted in Uncategorized, Federal Government, RNC, DNC, subsidies, Immigration Law and tagged Conservatism, Get involved, Illegal Immigration, National Security, News, Patriotism, Politics on January 13, 2019 by nixnewsfix.